The QLD training premiership has been Rob Heathcote’s for years now, this year has been different with Gollan and Dunn dominating the middle part of the season and opening a lead, that is until now. As expected when the carnival comes around Heathcote was always going to have some really nice horses returning and he always stands up this time of year. 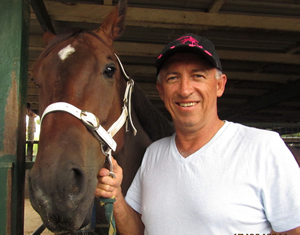 I caught up with Rob for a chat and although briefly we did talk about a few horses and also about what may happen next year when Eagle Farm goes under construction. Firstly I touched on Solzhenitsyn, a dual G1 winner who returned will a pass mark 1st up. “At this stage he will run but the handicappers say will matter. His first up run was ok, he is coming off throat surgery so there does still have to be a query. The first up run was good enough and it warrants going on with him. He has been set for the Stradbroke.” Heathcote said. Another two up and coming horses are Hopfgarten and Olympic Anthem who contest the Fred Best 1350m this Saturday. “Very, very hard race. Hopfgarten comes back from the mile race, he is a nice horse but I have elected to come back from the mile to 1350m and miss the derby as he is not that kind of horse. Olympic Anthem is a really nice horse in the making but still does a hell of a lot wrong. I reckon he is 12 months off. The 1350m tempo may help him relax.” Heathcote said. On another subject I have talked to a few people around the traps and it seems Eagle Farm may be out of action for at least 9 months. This has to happen, the track needs a total rip up and start again job, however can you imagine it will be difficult.